The PanAfGeo project is now taking part to the Mining Indaba event 2019! The event, happening this week from the 4th to 7th February will take place in Cape Town, South Africa, where the most influencing personalities working in the mining sector are expected to participate. 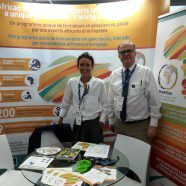 If you are interested in the African geology and want to know more about the sustainable use of African mineral resources and infrastructure, do not hesitate to visit the PanAfGeo booth number 515 at the Mining Indaba event! Moreover, we seize the opportunity to present you our new post card available in both English and French.